In Hebrew, Rosh Hashonah means "head of the cycle" or "first of the year." The special season known as Teshuvah, which in Hebrew means "to return or repent," begins on the first day of the month of Elul and continues 40 days. Each morning during the 30 days of the month of Elul, the trumpet (shofar) or ram's horn is blown to warn the people to repent and return to God. Rosh HaShanah, Feast of Trumpets, is a final 10 day period beginning 30 days into Teshuvah, on Tishrei l. The sabbath that falls within this 10 day period is called Shabbat Shuvah, the Sabbath of Return. This page is the description of Rosh HsShanah. These 10 days are known as the High Holy Days and as the Days of Awe. Orthodox and Conservative Jews celebrate two days of Rosh Hashonah. Reform Jews celebrate only the first. Teshuvah (repentance) speaks to all people. Those who believe in the Messiah are called to examine their lives and see where they have departed from God. It is a call to examine the Scriptures and the evidence that the Messiah was who He said He was. Five days after Yom Kippur is Sukkot, the Feast of Tabernacles. God has always had a heart to warn people before He proclaims judgment. God warned the people before the flood, and He warned Nineveh before it was ruined. He does not want anyone to receive the wrath of His judgment (Ezekiel [Yechezekel] 18:21-23,30-32; Zephaniah 2:1-3; 33:1-7; 2 Peter 3:9). Rosh HaShanah marks the Jewish New Year and is a part of the season of repentance. Rosh in Hebrew means "chief or head" and shanah means "year." Rosh HaShanah is the head of the year on the Jewish civil calendar. The Feast of Trumpets is the second most solemn day of the Jewish religious calendar, being surpassed in importance only by the Day of Atonment (Yom Kippur). The solemnity of the feast is hardly evident to a casual reader of the pertinent Biblical texts where the feast is simply designated as "a remembrance blast" (Lev 23:24) and "a day of blowing" (Num 29:1). Jewish tradition believes that Adam was created on this day (Mishnah, San Hedrin 38b). How did they decide that this was the day of the year the world was created? Because the first words of the Book of Genesis (Bereishit), "in the beginning," when changed around, read, Aleph b'Tishrei, or "on the first of Tishrei." Therefore, Rosh HaShanah is known as "the birthday of the world", for tradition tells us that the world was created then. To repeat: Rosh Ha Shanah is the start of the Jewish New Year (September or early October). It begins in the month of Tishri, the seventh month, the most important because of the significance of the number seven, meaning completeness. In 2015 Rosh HaShanah begins at sundown (or moonrise) on September 13th and ends at the same time on Tuesday, September 15th. During Rosh Hashanah services, and at the end of Yom Kippur, the shofar (a ram's horn) is blown like a trumpet. Hearing the shofar's call is a reminder for us to look inward and repent for the sins of the past year. We are beginning a new symbolic year. It will be Year 2776 in the Hebrew calendar. (See http://antipas.net/heb_cal.htm ). Rosh Ha Shanah is a time of self-examination, repentance and expiation of sins. During this time of personal inventory we measure ourselves against what we know we ought to be and strive to make greater effort. We look back at the mistakes of the past year and plan the changes to make in the new year. Rosh Hashonah looks toward fulfillment of peace and adjudication of all problems on earth. Of coarse, as we said, Yom Kippur - The Day of Atonement - is the end or climax of this 10 days. Orthodox Jewry believes Rosh Ha Shanah is the time of Heavenly Judgement. The Hosanna ("save") Shout originated here. The traditional greeting is lashana tova tikusevu, which means "may you be inscribed for a good year". 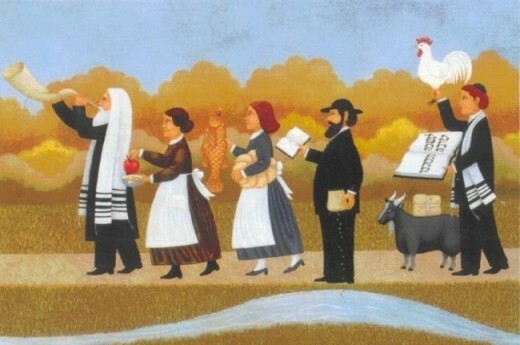 Else, Jews greet each other with the words L'Shanah tovah Tikko Sayvoo (May you have a good year) or Happy New Year!. In this festival Jews celebrate their liberty from Egypt and slavery. It is a feast of deliverance. Torah is carried through the congregation. As the Israelites overcame their foes, so we may see this feast as a type and similitude of the Second Coming of Christ, when the Savior will come with a shout and the blowing of trumpets or shofars and the children of Israel will come from everywhere to join him in the vanquishing of the Adversary and the ushering in of Zion. 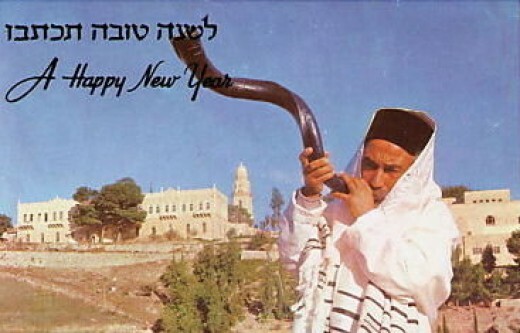 The shofar calls Jews to their special occasions. Usually a shofar, the ram's horn is blown on this holiday. God may use the ram's horn to deliver the trump sound of the Advent of the Savior. Rosh Hashonah also marks the day that God remembered his covenant people – A Day of Remembrance. Rosh Hashonah also commemorates the creation and fall of Adam and Eve and their covenant relationship with God. Adam and Eve learned how to return into the presence of God, through repentance. The blowing of the shofar may even signify the coronation of the King of the Universe — God. The Prophet Joseph Smith received the Golden Plates on Rosh haShanah. It was a sign that Heavenly Father would remember his covenants with Israel and bring them back from exile. This day, set at the time of Israel’s final agricultural harvest, also symbolizes the Lord’s final harvest of souls. Furthermore, it initiates the completion of the Lord’s time periods: the Days of Awe, and signifies the last time to prepare for final judgment and the Messianic Age. The coming forth of the Book of Mormon is literally fulfilling such prophecies of the day. (L.H. Reed) The angel Moroni commanded Joseph to come to the hill on September 22. To be precise in his compliance and still to throw off meddlers who knew of the date, Joseph chose to go to Cumorah in the dead of night, almost the minute September 22 arrived. The name Rosh HaShanah is used only once in the Tanach in Ezekiel 40. Ezekiel was in exile in Babylon when the Temple was destroyed, but he saw them in vision. This sacred Hebrew holiday is associated with the Feasts of Trumpets, which always fell on the first day of the seventh month, the Sabbatical month that ushered in the last three annual feasts, namely, Trumpets, Atonement and Tabernacles. 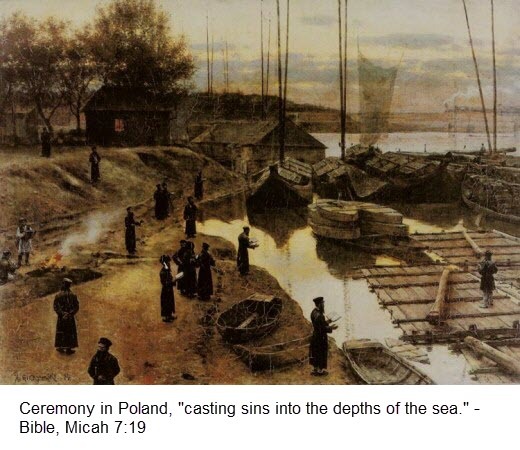 These feasts, which became known as "The High Holy Days," marked the conclusion of the religious year and typify the conclusion and consummation of the plan of redemption. The number seven, which is woven into the Biblical calendar, represents completion and termination. This meaning is accentuated in three feasts of the seventh month, since they completed the yearly cycle of sacrifices and harvests. The Sabbath day is every seventh day. The Sabbath year – each 7th year - has special significance. That is when the land in Israel lays fallow and when gleaners are welcome to pick over it. The Feast of Trumpets heralded through the blowing of trumpets the final phase of the Jewish religious year which, as we shall see, typologically brought to completion God’s plan for the final disposition of sin and the inauguration of a new world. The first reference to the Feast of the Trumpets is found in Leviticus 23:24: "In the seventh month, on the first day of the month, you shall observe a day of solemn rest [shabbaton], a memorial proclamation with a blast of trumpets (ziccaron teruah), a holy convocation." The Hebrew phrase ziccaron teruah can be literally translated as "a remembrance blast." The term shabbaton "a day of solemn rest" is mentioned in the Bible in conjunction with the Sabbath (Ex 16:23), the Day of Atonment (Lev 16:3), and the Feast of Tabernacles (Lev 23:39). Thus the term is commonly used for other festivals as well. There’s also the “harvest moon” in September on or near the Fall Equinox which has to do with the gathering in of the last harvest of crops. Farmers worked through the night by the light of the full moon. The Feast of Trumpets celebrates the final season for the gathering in of the wine and oil — it is the final harvest. The “Book of Mormon” is the means of bringing in the final harvest as well–the final gathering which began with Joseph Smith. Much more at http://www.hebroots.org/sevenfestivals_chap7.htm, a Messianic (non-LDS) site. Sweet food is served at dinner in the hope of a sweet, happy new year. Serving lakach (honey cake) is traditional for this happy festival. Here is an easy lakach recipe for you to make. Cream sugar and eggs well. Add oil and honey and mix thoroughly. Sift dry ingredients together and add to mixture alternately with warm water. Pour into greased and floured pan, sprinkle with almonds, and bake in moderate over (350º) for 1 hour.